Ah, the call of the open road. For as long as I can remember, I ride my motorcycle every day regardless of weather. Not; however when the roads are covered in snow or black ice. But give me clear asphalt and I’m on two wheels logging the miles. Even if its “just” my daily commute, the trip is always something new. Still, I find myself missing a nice long road trip. A few days on the road, nights in a cheap motel meeting people along the way, changing scenery. When I lived in Arizona, I logged at least two road trips a year to New Jersey to work or see family. Since I’ve moved back to my home state, that “need” is gone. Yup, I’ve got the itch to burn the miles. Unfortunately, its the busy season at work and a few days off is impossible. So, what to do? My last road trip was the return trip back to New Jersey after the Arizona house sold. I made that trip alone as my wife flew out ahead of me and my road companion Chloe had passed. I started the trip the Monday of Thanksgiving week 2014 and arrived in New Jersey Thanksgiving Day. Too late for either Thanksgiving dinner or pumpkin pie. But it was another safe road trip in the books. Naturally I used kata along the way to enhance the pleasure of being on the road and to refresh myself physically and mentally during the four day, 2,600 mile trip. As I knew it would be my last long trip for a while, I videoed my kata and journey. 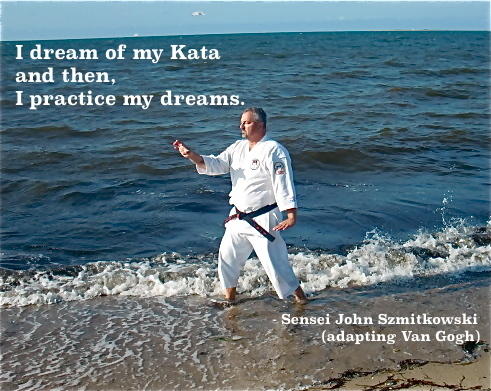 Looking at my videos, I realized I can again enjoy the memory of the journey through my kata. So, Monday of this week, I began to perform my “On The Road Kata.” As for this writing, I’ve completed the first two days (Monday and Tuesday) kata and am working on day three (Wednesday) as this is posting. Tomorrow, I’ll symbolically end my journey. 2. 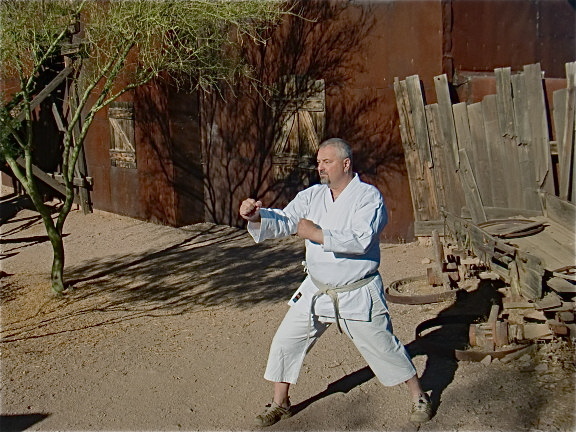 Kunchaba Kata – my weekly Wednesday Kata tribute to Shihan Wayne Norlander filmed at Loretta Lynn’s Country Kitchen, Hurricane Mills, Tennessee. (See Endnote # 1 for a video which includes a touching soundtrack by Warren Zevon). 1. Sanchin Kata (Shobu version) at a gas station on highway I-78 in Pennsylvania. Thanks for reading and watching. Have a really Happy Thanksgiving, 2017. My seminars are the ONLY seminars that allow you to pay at the conclusion, thus insuring your complete satisfaction! 1. My video tribute from the road to Shihan Wayne Norlander featuring the song, “Keep Me In Your Heart” by Warren Zevon. I miss the Karate-Do training we shared and motorcycle rides we took. This article is a continuation of my exploration of time as a fourth dimension of distance. For those unfamiliar with this concept there are several video and other resources in Endnote # 1. 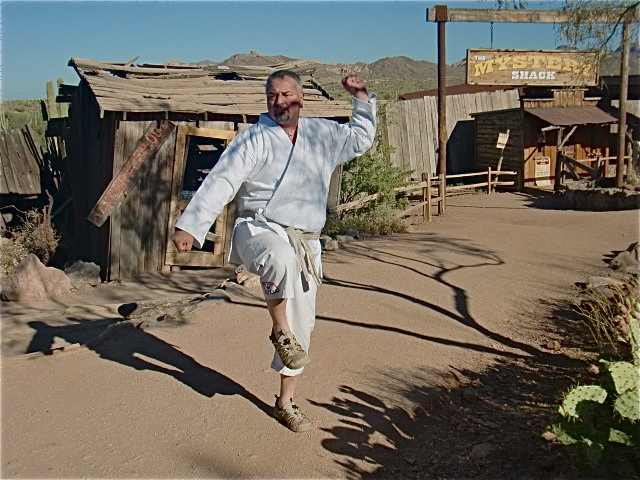 Simply put, most martial artists think of distance as a function of the three dimensions of length, width and height. To do so omits the all important fourth dimension of time. Time as a fourth dimension of distance is easily appreciated when you practice your kata. Exploration of the time dimension is facilitated by expanding your kata bunkai (analysis) to include consideration of time. How does time affect kata and its application is a subject limited only by the imagination of the karate-ka (practitioner). 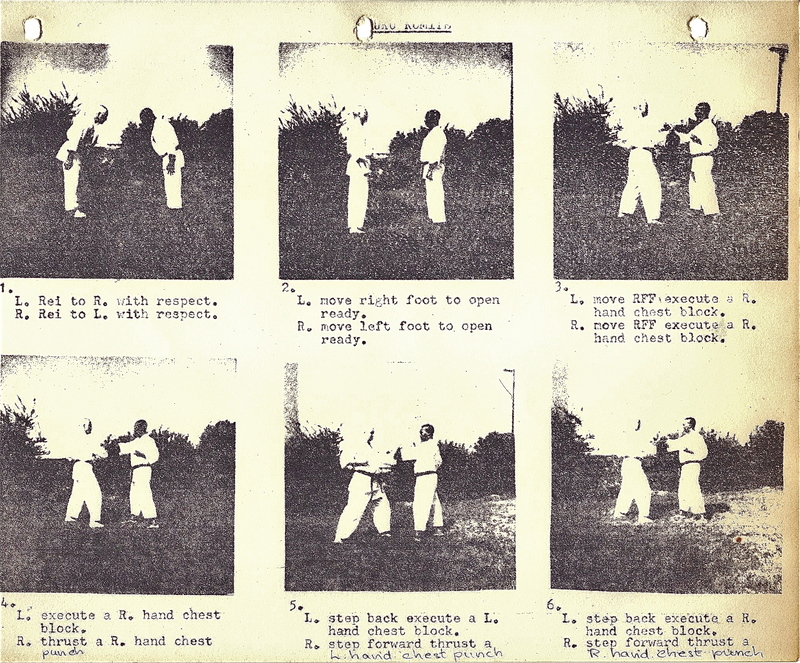 Kata bunkai is a continuing on-going process. 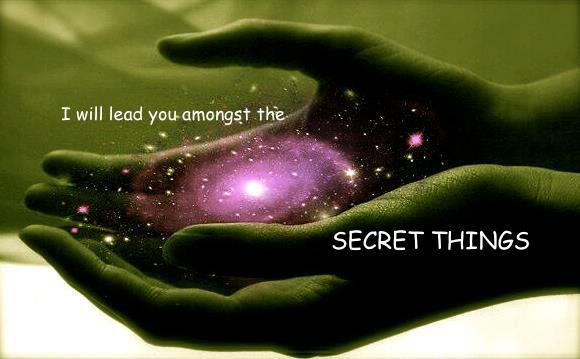 It is limited only by your imagination. The within article is a good example of that process. I was practicing my Fuku and Gekisai Kata by modifying certain interim movements. Specifically, I was exploring the block, lunge punch block sequence (see Endnote # 2 for a full discussion of this concept). Traditionally, the three movements are performed with kime (focus). To facilitate my study, I found it helpful to perform the last block in the series not with kime, but, with breathing and dynamic tension as in Sanchin Kata. I was studying had the corollary effect of modifying the rhythm of the sequence. In the past, I had briefly explored a modification of kata rhythm using the Seienchin Kata as an example. (See Endnote # 4 for a video of same). This exploration was but a fundamental step in my on going process. 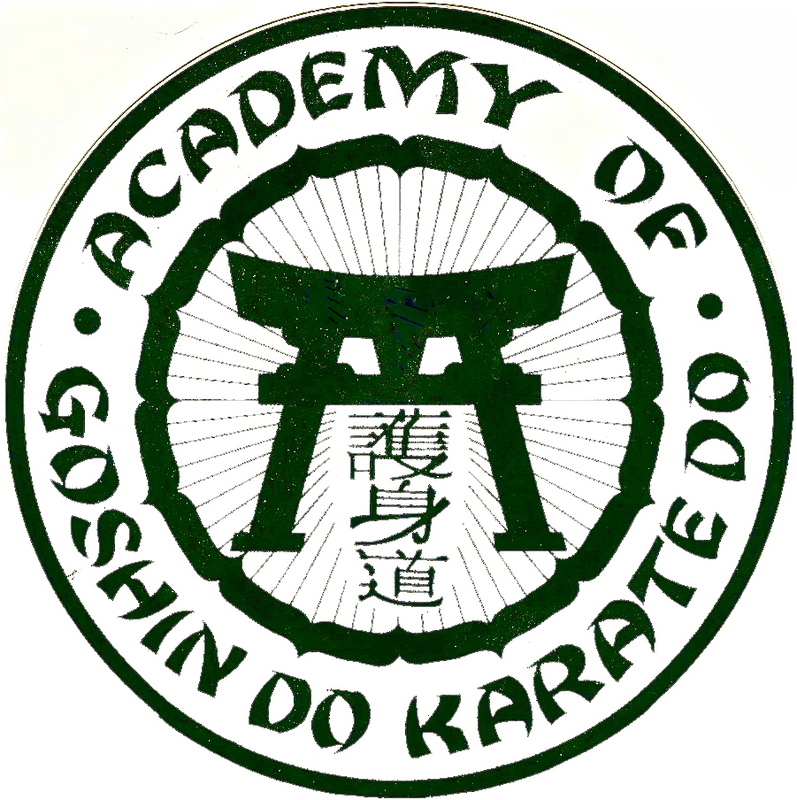 I began to utilize the opening of the Goshin-Do Karate Seisan Kata to explore how the concept of time as a fourth dimension of distance can result in a corollary rhythmic modification of a kata. 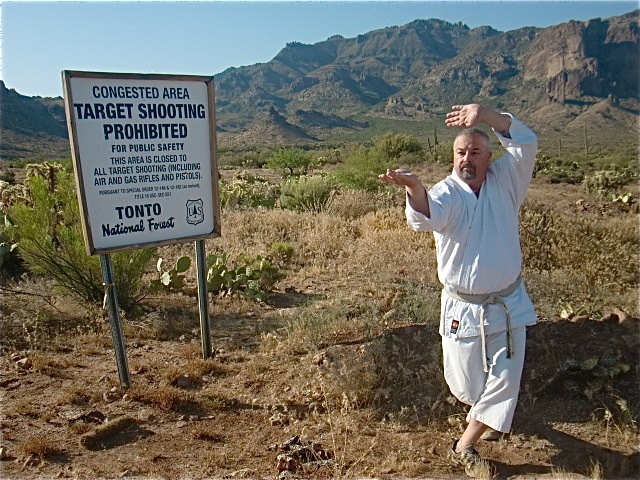 (See Endnote # 5 for a video of the Seisan Kata and a bonus – historical footage of Hanshi Frank Van Lenten performing Seisan!). Using the opening of Seisan Kata, I began to understand the corollary rhythmic modification. To illustrate the concept, the abbreviation “K” will signify that the movement is performed with kime (focus- hard and fast). 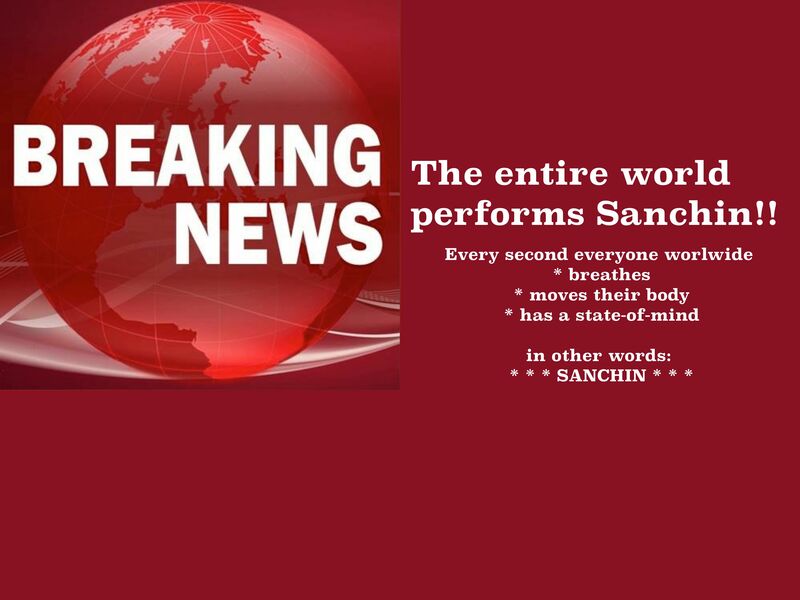 “S” will signify the movement is performed with Sanchin breathing and dynamic tension. Using the photos below you can see the time modification of combining the block and counter and the resulting corollary rhythmic modification. Move # 2: rotate hand and “grab” (S). Exploring how the change in rhythm affects not only the kata but your bunkai (analysis) is full of possibilities. For the inquisitive practitioner it affords the ability to see into the full range of bunkai available from not only a physical aspect but also a spiritual and environmental aspect. (See Endnote # 6 for a full discussion of the three aspects of bunkai). Understanding the fourth dimension of time as a component part of your kata will provide you with a rich and more complete understanding of not only your kata, but, also yourself. It is fertile ground limited only by the boundaries of your own imagination. “Life is a kata.” separately copyrighted. With Summer 2014 in the history books, I hope you all enjoyed a great Summer filled with many memories. Here’s a recap of what you may have missed while on vacation and making those memories. As is tradition here on my blog, September marks a new “academic year.” I have many things planned and know you will enjoy and be challenged in the weeks and months that come. Also look for new kata videos which are in production right now. © Copyright 2014 Issho Productions & John Szmitkowski, all rights reserved. So the priest went up to the monk and asked “Why do you always carry that mirror?” thinking for sure this would prove his guilt. Sensei John is now on Facebook, under – FLY FISHING DOJO, you are invited to send a Facebook friend request. Ah, This is Okinawa Karate-Do! 1. 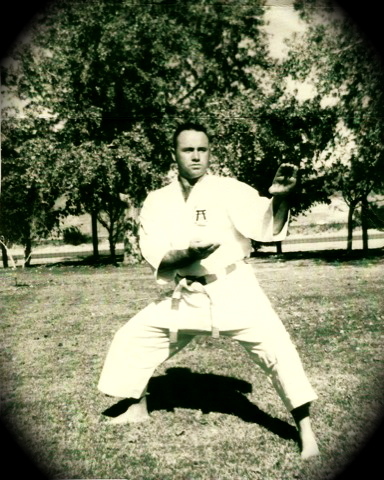 For several videos with archival footage of either Shihan Van Lenten, or members of his Goshin-Do Karate-Do Kyokai (Association), circa the late 1960’s to early 1970’s please visit the “Kata Syllabus” page tab above. Kokoro o mamaru, Mi o mamaru. Sensei John is now on Facebook, under the user name – FLY FISHING DOJO, you are invited to send a Facebook friend request. Today marks the three year anniversary of the passing of Hanshi Frank Van Lenten, the founder of the Goshin-Do Karate-Do Kyokai and style of karate-do. Today’s training and the following Hatsu Bon Poem are offered to his spirit. Should today’s readers so desire, please join us and perform a kata of your choice in his memory. May Hanshi’s spirit find our training and poem worthy. I have reconstructed several of Hanshi Van Lenten’s Goshin-Do Karate-Do Kyokai kata which were lost after he disbanded the kyokai in 1983; links to these kata follow the poem. That watches over your sleep. That’s not where I am. I have been born anew. 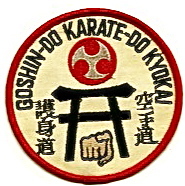 Here videos of several of Goshin-Do Karate-Do Kyokai kata unique to Hanshi Van Lenten. 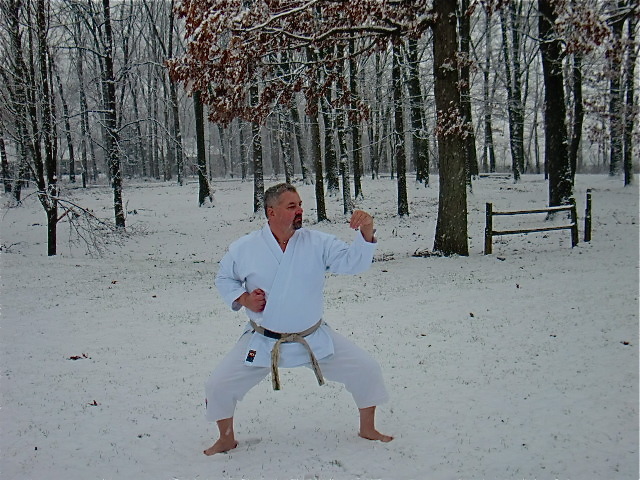 Kanto Kata – created by Hanshi Van Lenten at the request of his various Okinawa Sensei to symbolize his Goshin-Do Karate-Do style. 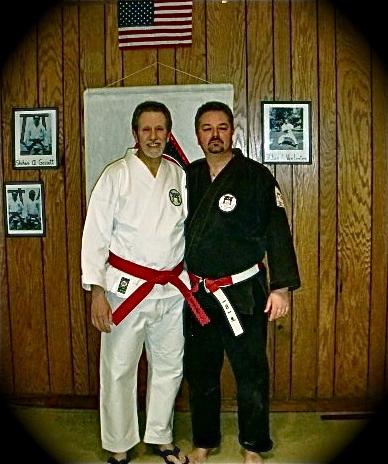 The kata and style were approved by Hanshi’s several Okinawa Sensei as being Okinawa-based. 1. 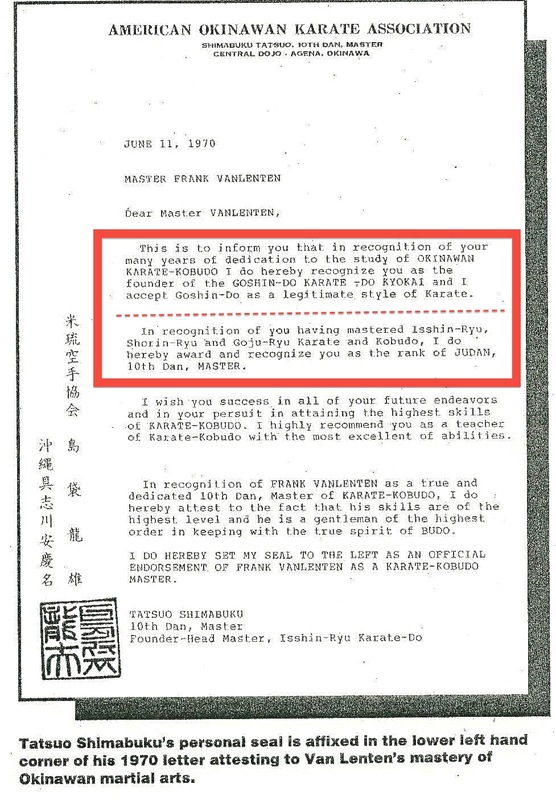 Copy of Shimaboku, Tatsuo-Sensei’s letter to Hanshi Van Lenten as featured in the Sunsu Kata video (link is above). 2. My sincerest thanks to Shihan Thomas DeFelice (Ku-Dan Goshin-Do Karate-Do) for providing the text and photographs of Jion and Jitte Kata, and Hanshi Jerry Thompson (Arts Of Self-Defense), Shihan Ed DiNardo (Hachi-dan, Arts Of Self-Defense, New Jersey and Arizona) and Kyoshi Tom Van Tassel (Nana-Dan, American Center For Martial Arts, New Jersey) for providing the films of Hanshi Van Lenten. I’ve come to identify several deficiencies with the commonly accepted method of kata training and bunkai (analysis) associated with kata. I do not use the word “deficiencies” as a criticism of the commonly accepted methodology utilized by my karate-do brethren. Rather, I use the word simply to describe areas of established training methods that were insufficient from my personal perspective. 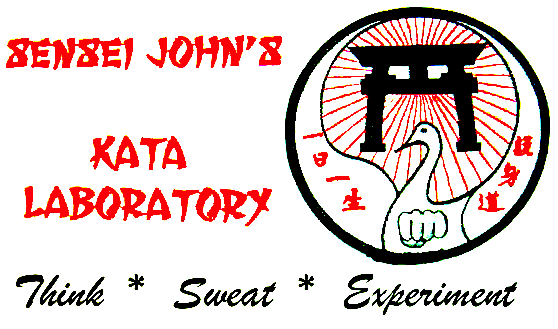 This installment of the Kata Lab sets forth my basic procedure to allow the advanced student can go beyond the commonly accepted choreographed kata applications. This procedure can then be built upon with more complicated kata and bunkai protocols. The commonly accepted manner of introducing a student to the subject of application of kata usually involves three general procedures. I call these procedures the “drill procedure”, the “storyboard procedure” and the “kumite procedure”. In the drill procedure students learn various choreographed drills in addition to and as a supplement to kata training. For purposes of this submission, I reject the drill procedure as a kata procedure. It does not rely upon kata and is taught in addition to and unrelated to the kata, thus it is a separate part of the overall karate-do curriculum. 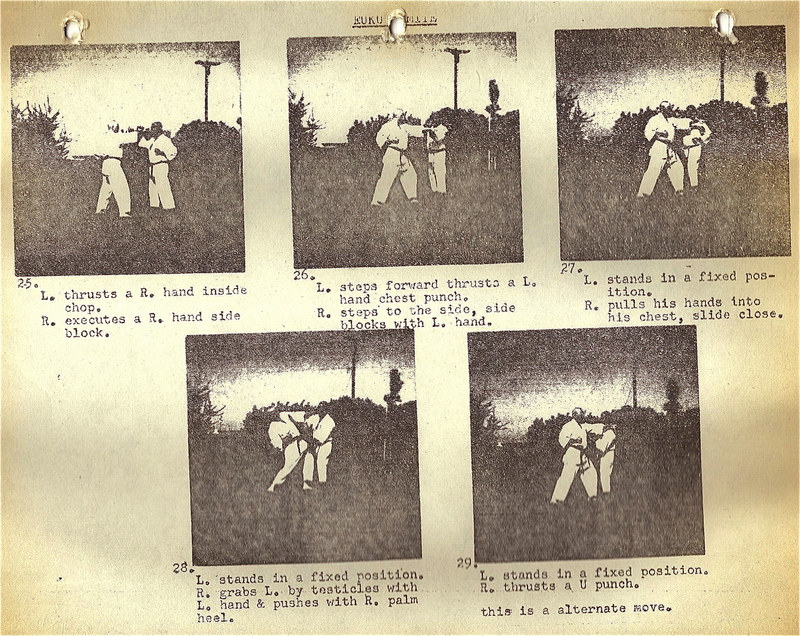 The storyboard procedure involves the use of partners who attack the kata performer as he performs the kata sequences within the established pattern of the kata. (See Endnote # 4) Within the Goshin-Do Karate-Do Dojo, this was a common approach. In the kata storyboard, the performer would stand ready to perform the kata. A number of students, acting as attackers, would position themselves around the performer, in front, back and left and right sides. In turn, as determined by the pattern of the kata, each attacker would attack the performer with a pre-determined technique directed at the appropriate target. The performer would perform the normal kata sequences and pattern responding to each choreographed attack. The essence of this procedure is that the performer executes the kata sequences and PRESERVES the kata pattern. The kumite procedure involves the performer executing the kata sequences but REJECTS the kata pattern in favor of a linear pattern. Thus the kumite procedure involves only two individuals, the kata performer and his partner (who serves as an attacker). For those readers familiar with a classical Goju-Ryu curriculum, examples of this procedure are the Gekisai-Dai-Ichi kumite set and the Gekisai-Dai-Ni kumite set. 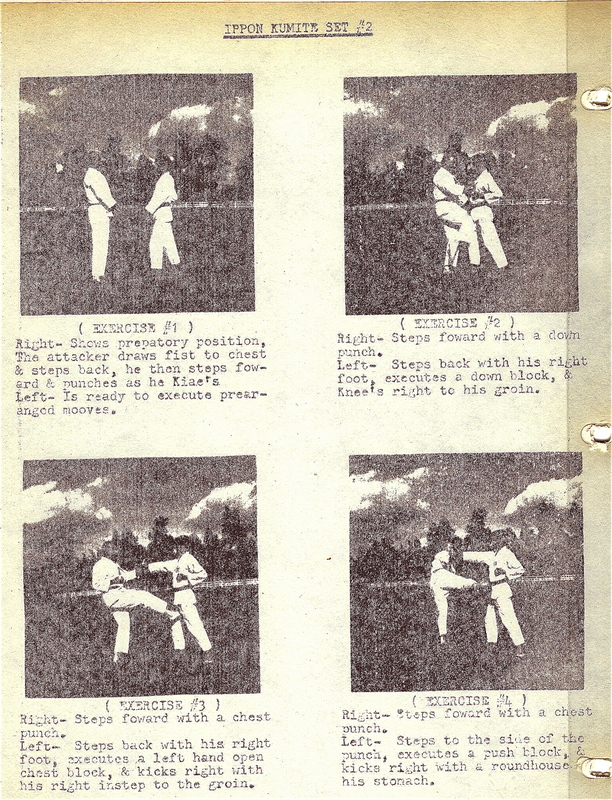 Within the former Goshin-Do Karate-Do Kyokai, such kumite procedures existed as the Fuku kumite and the Gekisai kumite (please see Endnote # 5 for the unique origin of Hanshi Van Lenten’s Gekisai Kata). 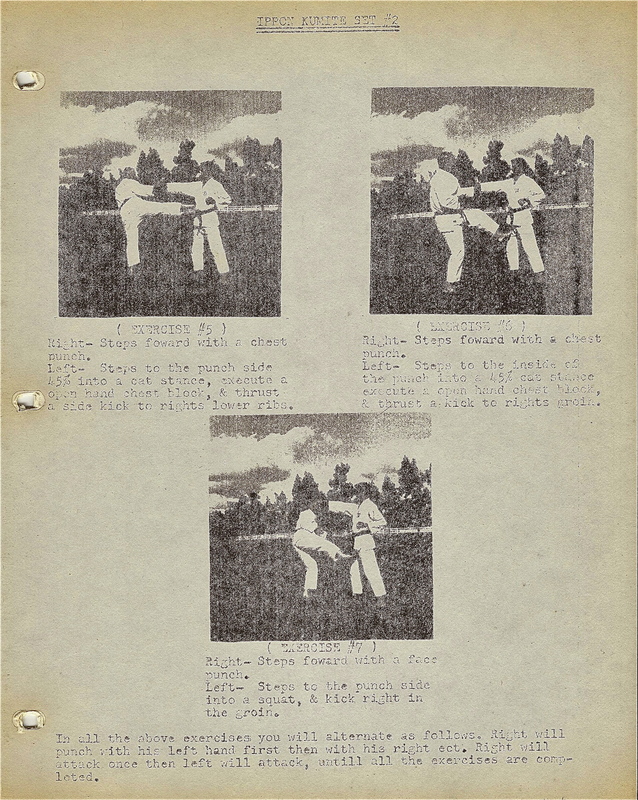 Archival photographs of Hanshi Van Lenten and Sensei Wesley Evans performing the Fuku Kumite and HISTORIC video of them performing kumite drills may be found in Endnote # 6. Both approaches are limited by a lack of spontaneity in the methodology of attack and kata. As such, they are susceptible to predictable boredom with repeated practice over the long term. For these reasons, and others, I developed the concept of kata deconstruction as a foundation upon which to build more advanced kata bunkai (analysis). My procedure is a very simple procedure for any student to utilize and subsequently build upon based upon individual needs. repeat until you have performed the entire kata. note: it does not matter that you neither end facing in the same direction that you started nor that positional coincidence (see Endnote # 7) is preserved. NOTE: As you can see from the video below, while the pattern of the kata is ignored, it is of the utmost importance to pay attention to the accuracy of the kata sequences as if they were performed within the kata pattern. That is to say, one must follow from the other. To assist you with the above, I have created a video of Gekisai Kata performed normally and as deconstructed with sequences identified. First and foremost, more advanced procedures are built using this simple procedure. 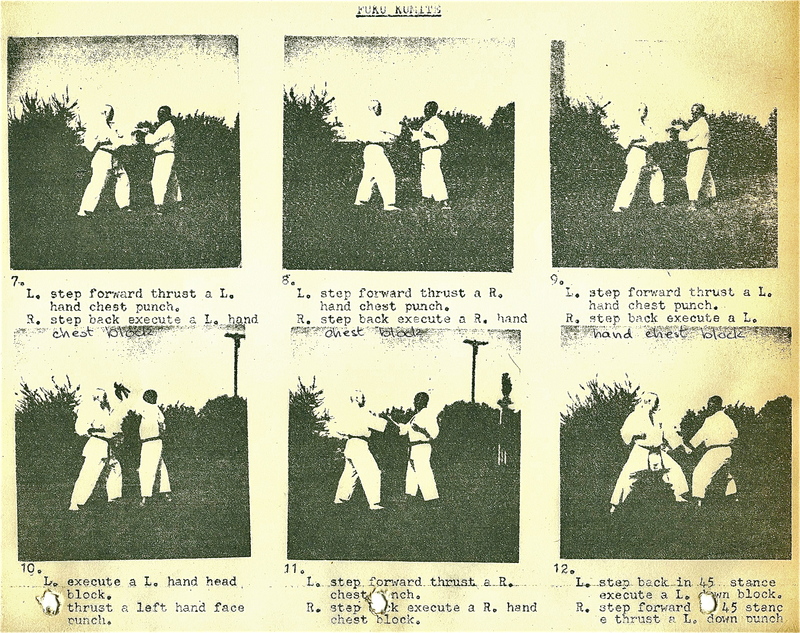 For one, simple, example, ippon kumite is inserted into the procedure in lieu of the walking seen in the video. 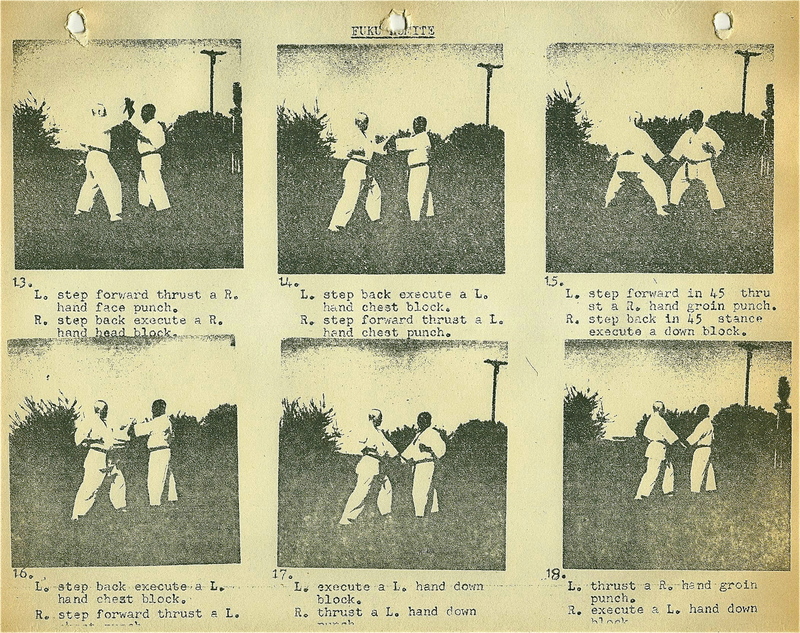 The partner does not have to learn anything new, such as the sequence of a storyboard or the sequence of a kumite drill. 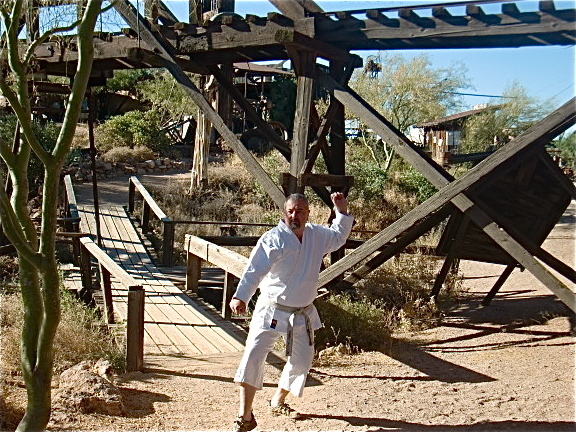 On a more advanced level, deconstruction allows the performer to begin to understand the spiritual underpinnings unique to each specific kata. By supplementing routine kata practice and commonly accepted partner applications with my kata deconstruction – a simple exercise that preserves the kata’s sequences but ignores the kata pattern, – a foundation is established whereby more detailed bunkai (analysis) can be conducted. 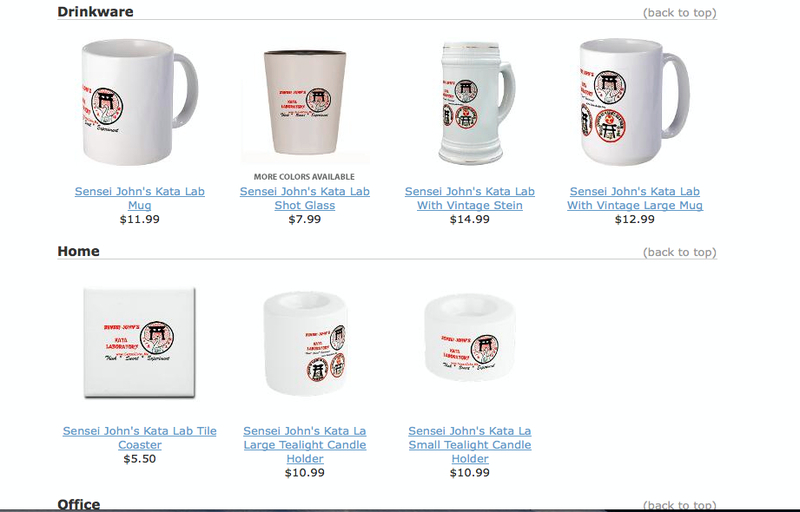 These more advanced procedures will be set forth and discussed in future submissions in the Kata Laboratory. ☑ Sweat – work, again and again, the protocol of the experiment as set forth. This aspect is crucial. I wholeheartedly invite commentary and yes, even criticism but please SWEAT FIRST, do not pontificate. Comments such as “That’s not the way we do it”, or, “That’s not traditional”, “That’s not pure in our system” and the like are not only egotistical and insulting, but will show the depth of your hubris, and laziness. ☑ Experiment – after sufficiently working the specific protocols, begin to experiment with your own thoughts and variations. Do not be afraid of failure – the only failure is not thinking and sweating for yourself but being a slave to dogma. © Copyright 2006 and 2013 Issho Productions & John Szmitkowski, all rights reserved. 1. Hemingway, Ernest, A Moveable Feast (Simon and Schuster, New York, NY, 1996) p. 76. 3. 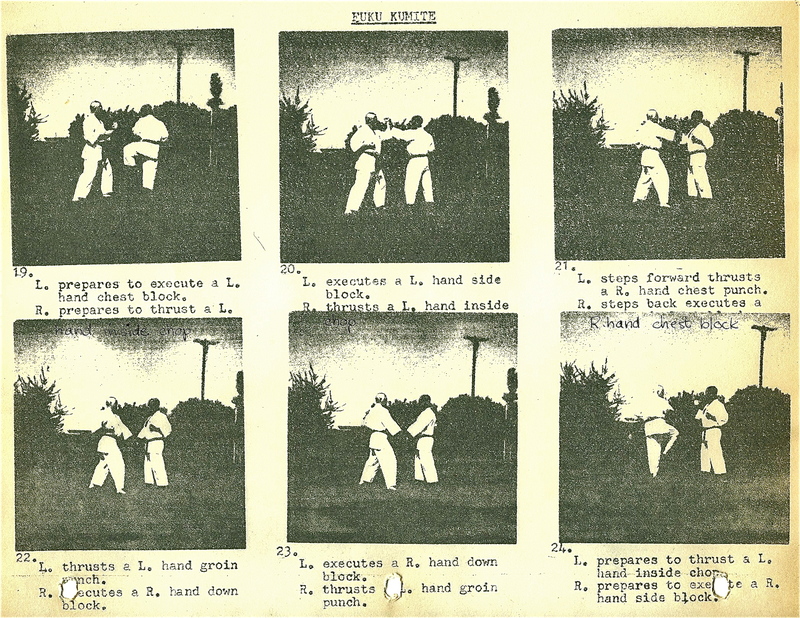 Extremely rare and unique archival photographs of Hanshi Van Lenten performing one such drill – “Kumite set number 2” – (please click on thumbnail to enlarge and use the “back browser” to return here). 4. The storyboard procedure was analyzed and critiqued in my work: Koryu Kata-jitsu: Ancient Style Art Of Kata (Issho Publications, East Rutherford, NJ 2001). 5. 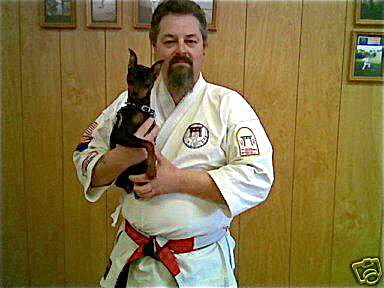 Sensei Van Lenten’s Gekisai Kata (which is preserved in the Goshin-Do Karate-Do style of Shihan DeFelice) is the unique Gekisai-Dai-San Kata of Sensei Seikichi Toguchi who, in addition to Sensei Masanobu Shinjo, taught Sensei Van Lenten Goju-Ryu Karate-Do. 6. Extremely rare and unique archival photographs of Hanshi Van Lenten performing Fuku Kumite: – (please click on thumbnail to enlarge and use the “back browser” to return here). 7. Positional coincidence is a concept, found in “modern’ (post 1940) kata, that requires the kata to begin and end at the same point. Filming the Kata Deconstructed video was bittersweet – it was a “first” on many fronts: the first in my Kata Laboratory category but also the first video without little Chloe (who passed away February 14th, 2013) as part of the video crew.